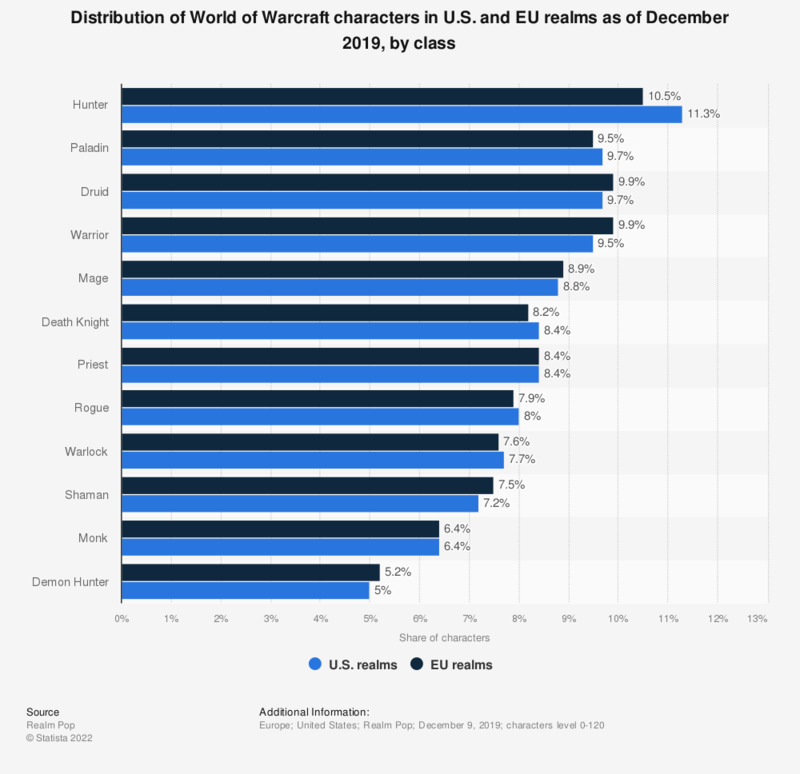 The statistic shows the share of the various classes in the online computer game World of Warcraft (WoW) as of February 1, 2019. Approximately 9.4 percent of the created characters in U.S. realms were warriors. In terms of race, despite such possibilities as Night Elf, Orc, or Goblin, most players chose to be human in the game. All in all, World of Warcraft's popularity as such is reflected in the game being one of the bestselling PC games worldwide. Both among European and American players, the hunter is the most popular class. Its popularity might result from the fact that hunters excel in using ranged weapons, such as bows and cross bows and can take part in battles from a distance, thus reducing the possibility of getting hurt or even killed. Hunters also come with the advantage of being able to tame animals and keep pets. This class is almost equally popular among Horde and Alliance characters. Among U.S. based players, 11.8 percent of Alliance and 11.2 percent of Horde members were hunters. In Europe, the shares amount to 11.1 and 10.5 percent respectively. The least popular class, on the other hand, is the demon hunter which is chosen by around four percent of all players. For this analysis, 24.6 million characters on US realms and 23.1 million characters on EU realms were recorded. The data were collected by using Blizzard's Battle.net API.